Wood adds warmth. Wood flooring today encompasses many species and grades, including bamboo, walnut, cherry and flooring milled from reclaimed lumber. The finished floor surfaces in your home have to endure a daily dose of heavy traffic and look good doing it. With pets and people subjecting your flooring to abrasion, impacts, moisture and dirt, it's amazing that flooring lasts as long as it does. But when wear becomes evident and care requirements increase, it's time to consider having new flooring installed. You may also require new flooring if you're building an addition, remodeling a room or repairing a damaged part of your house. In all these instances, My-Pros can help you select the type and style of flooring that fits your project requirements. We offer flooring installation in Rockford, Loves Park, Belvidere and throughout Illinois and Wisconsin. Contact us today for an estimate! Tile is essential in wet environments. Tile flooring's water-resistant properties make it a must in bathrooms, but it is also a great choice for kitchens, mudrooms, and entryways. Wood flooring: The look and feel of a solid wood floor has a timeless appeal that can enhance the appearance and value of any house. Today, home and business owners interested in wood flooring can select from a wide range of wood species and flooring grades, including oak, maple, cherry, and hickory. "Green" flooring made from salvaged lumber is also available. Although solid wood flooring is available with a factory-applied finish, most solid wood floors are installed unfinished, then sanded and finished on site. Prefinished engineered wood floors: An "engineered" wood floor is made from thin wood plies, like plywood. The top "wear" layer can be made from just about any popular wood species. Most engineered wood flooring comes with a super-durable, factory-applied finish. If the wear layer is thicker than 1/8 in., the floor can be refinished at least once. The main advantage with this type of flooring is that you get the look of a solid wood floor, but you don't need to wait for the floor to be sanded and finished; it's usable right after installation. Ready right away. Most engineered wood flooring comes with a factory-applied finish. It's ready for traffic as soon as the last board is installed. Laminate flooring: Laminate flooring is popular because it's affordable and remarkably versatile. It can be manufactured to look like ceramic tile, wood, or stone. Better brands of laminate flooring look convincingly real, but don't cost nearly as much as the genuine material. Although laminate flooring is durable, it's not indestructible. Once damaged, a square or plank of laminate flooring has to be replaced; it can't be repaired or refinished. Tile flooring: Like a solid wood floor, a tile floor is very traditional, especially in moist locations like the kitchen, bathroom, or entry foyer. Flooring tiles come in many sizes and styles, so it's not surprising that this flooring option can vary greatly in price. Vinyl flooring: One of the most economical flooring choices, vinyl flooring is available as flooring tiles and also in sheet form. Most styles of vinyl flooring are designed to resemble tile or other masonry materials. Vinyl flooring is popular in kitchens, bathrooms, laundry rooms, playrooms, and utility rooms. When it comes to your flooring, you want to make sure the job is done correctly no matter what material you're installing. At My-Pros, we help you choose the best flooring material for your home and handle the installation process from start to finish. 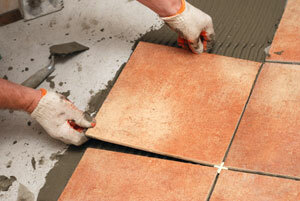 If you want to upgrade the flooring in your home, call the local experts at My-Pros today. Whether you're working on a home remodeling project or simply want to update your floors, we have the quality products and materials to give you a beautiful, long-lasting floor. We offer free estimates on all our work in Belvidere, Rockford, Loves Park, Machesney Park, Beloit, Roscoe, South Beloit, Rockton, Marengo, Harvard and nearby, so call us today get started!